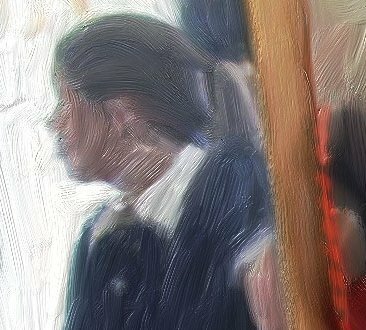 I’ve been playing recently with Corel Painter, which lets you fake the look of natural media (like paintbrushes, watercolors) on a computer. It’s a lot of fun, and whilst it’s clearly fake, it sure impresses those who haven’t seen it before. I’ve also been wasting my youth enjoying my holidays with the latest incarnation of the game Civilization. Gameplay and balance works quite well in Civ 4, although I’m still not convinced on the change from 2D to 3D graphics. I think that Civ 1 had the most usable graphics – even if they weren’t pretty, you could easily tell different units and different terrain apart. Civ 4 looks more subtly blended/integrated and “realistic” (although either I have very tall people or very small buildings), but it’s harder to distinguish between a temple and a cathedral, for example. Wesnoth is 2D, and I quite like it’s distinctive visual style (is the 1990s sufficiently old to be “retro”?) in the current climate of games-must-be-3D think. As a bonus, some guy made “ye olde mappe” style Wesnoth maps. 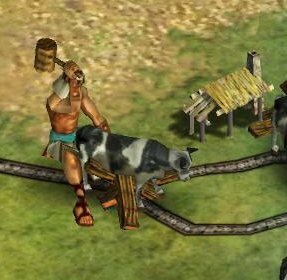 And, with 3D, you sometimes get images like these, as spotted on the Civ forums.